InProc sessions denote the sessions that we are familiar with in traditional ASP. State server is a machine whose memory is used to store just the state of the session from some other machine. 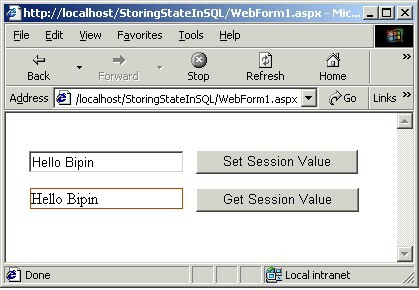 We can also use SQL server as session state store. The later options are more suitable if you are developing web farm kind of applications. In this article we will take a look at storing the session state in a SQL server database. Create your ASP.NET web forms as usual and access the session inside the pages. For illustration purpose I have created a VS.NET solution that does that. Following is the screen shot of the web form. This page simply allows you to store string values to session and then display the value in a label. Now all the session variables are stored in the table rather than in memory. 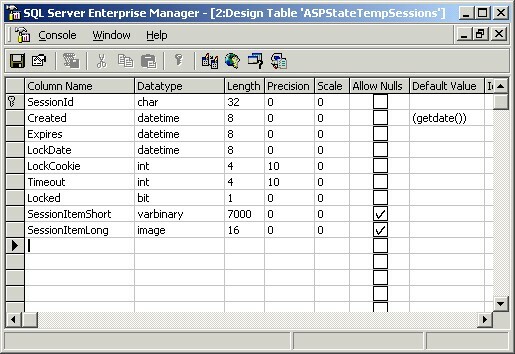 You can open the table ASPStateTempSessions and verify the same. If you want to remove all the databases and tables created during install process Microsoft has provided UninstallSQLState.sql file in the same location discussed previously.